Meanwhile, on Saturday, September 26, there is a great little apple festival in Monmouth. We have a great KVBC ride to the Apple Fest from Winthrop all mapped out, but we need a ride leader (I have to cover the Common Ground Fair that day). If anyone can lead the ride (honestly, the hot apple pie is not to be missed) let me know, and I'll get the ride maps to you and the ride announcement out to everyone. Wish I could be two places at once. "The Seven Hills of Rome" - a roadside tour of the many hillside trails through Rome and Belgrade. START: 10:00 AM, Rome Town Hall at the corner of Rt. 225 and Mercer Road, about 0.3 mi from the junction of Rt. 27 and Rt. 225. 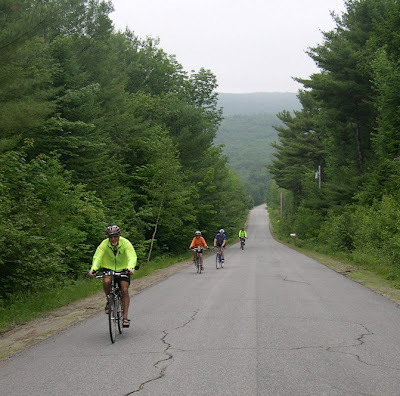 HIGHLIGHTS: the route passes 5 trailheads, Blueberry Hill and the Kennebec Highlands. There is an optional short hike up French's Mountain to a spectacular scenic vista.